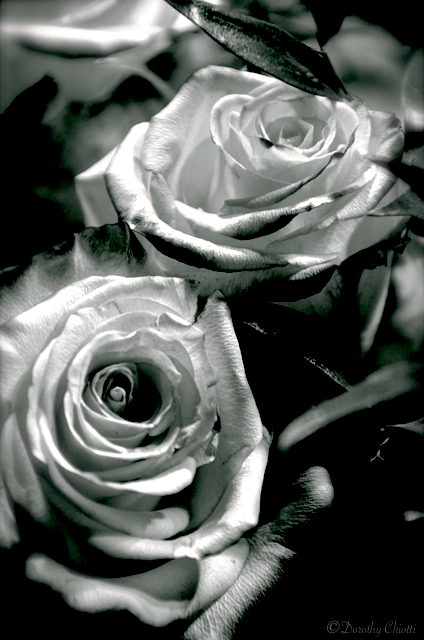 These roses are not black and white. I created a filter to be able see them differently. … swirls of precious energy bound into beautiful blooms of life. We view life through the filter we create based on our experiences ~ both good and bad. Just because the filter is there does not mean it can’t be changed. Such limitations we put on ourselves when we refuse to see life in a broader spectrum. Opening our eyes to new possibilities opens our heart to new understanding. Changing the filter once in a while allows room for us to be amazed. This entry was posted in Flowers, Inspiration, Photography and tagged black and white, Dorothy Chiotti, filters, inspiration, Leanne Cole, Life, monochrome, Personal Growth, Photography, roses. Bookmark the permalink. Yes, very wise advice, Dorothy. Lovely photo, too.